"The sangat loves your celestial communication. It uplifts everyone." "I am overcome with gratitude for this beautiful meditation you have shared with us today! You are positively radiant! Your light shines so bright, that even with my eyes closed I feel your warmth and love. Thank you, my sister on this Divine Path." "Adarsh has a wonderful presence, is believable and truly enjoys what she does. She is so radiant." 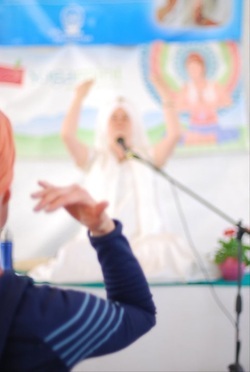 "If I could do one thing to lift my spirit to its natural state of joy on any given day it would be Adarsh's Celestial Communication class or workshop! blissful!" "Thank YOU Adarsh for the most amazing class. I absolutely loved it, so heart opening. 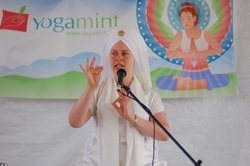 I hope to practice the Dhan Dhan Ram Das Guru...I just loved every moment of it, and I just loved capturing peoples experience of your class. Thank you for your devotion and expansion x"